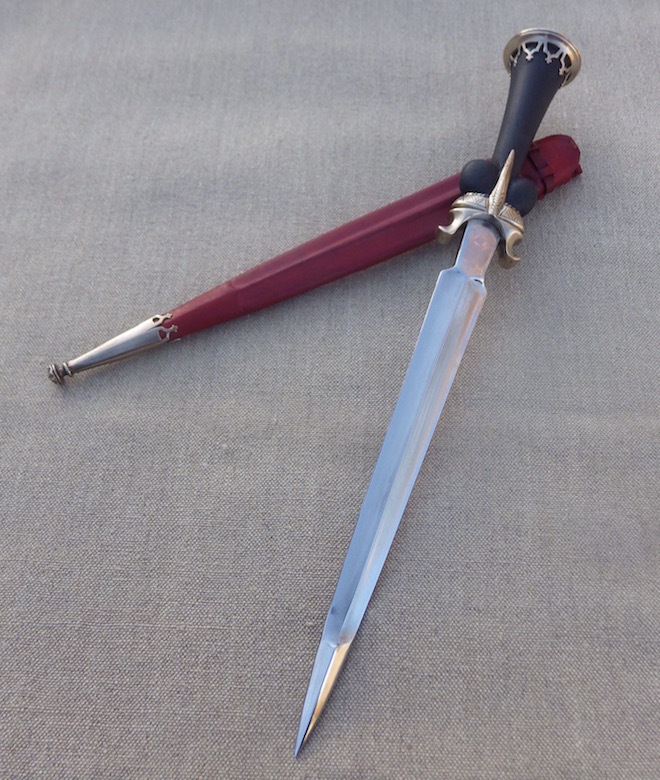 This dagger is a composite piece with a grip heavily based on a piece from Rothenberg and the blade is based on a dagger shown below, but I do not know the source of the picture or the piece. 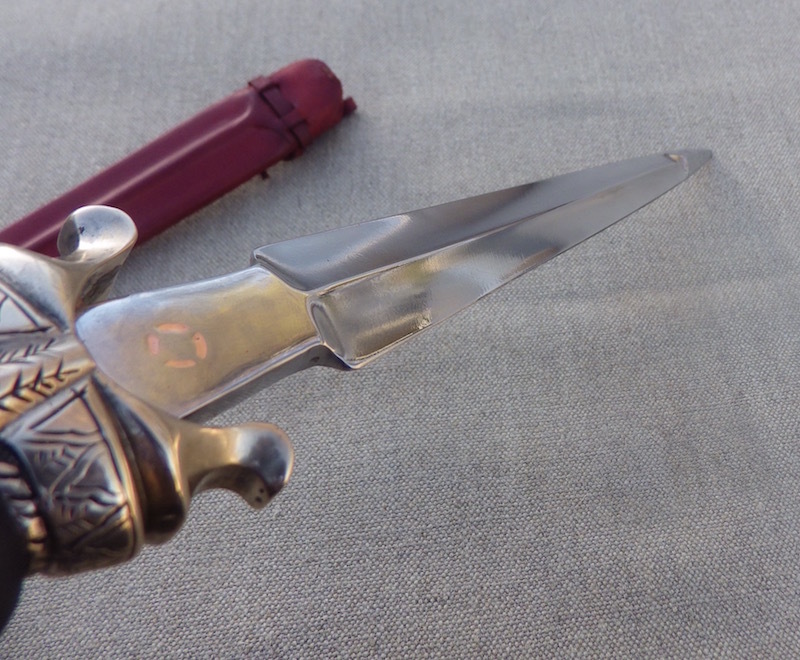 The collection at Rothenberg has a great many stunning pieces, bit unfortunately I have yet to get there to study them in person, but the hilt from this dagger is based on a piece from there. The top cap has a latin inscription that is variously translated, but I think says 'The right hand of God makes wonder", the cap is in bronze and the original has a silver plate set below cut outs. 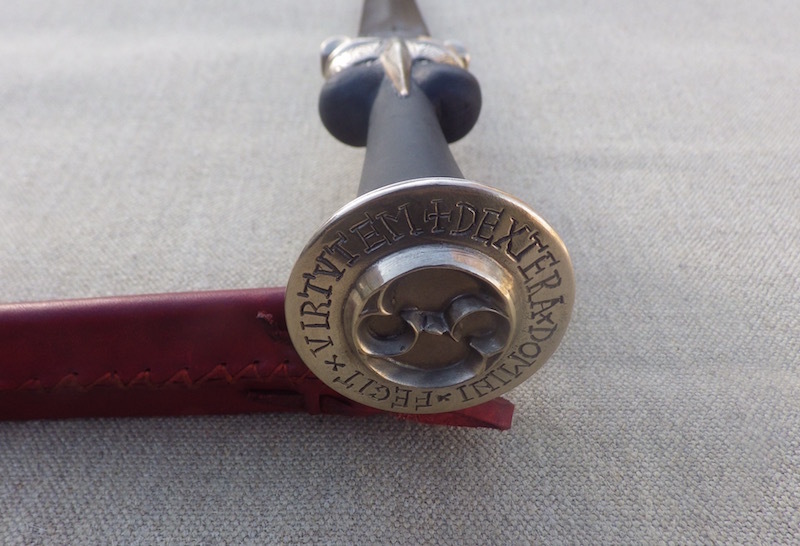 The grip itself is dyed and waxed elm and the guard is also in bronze. 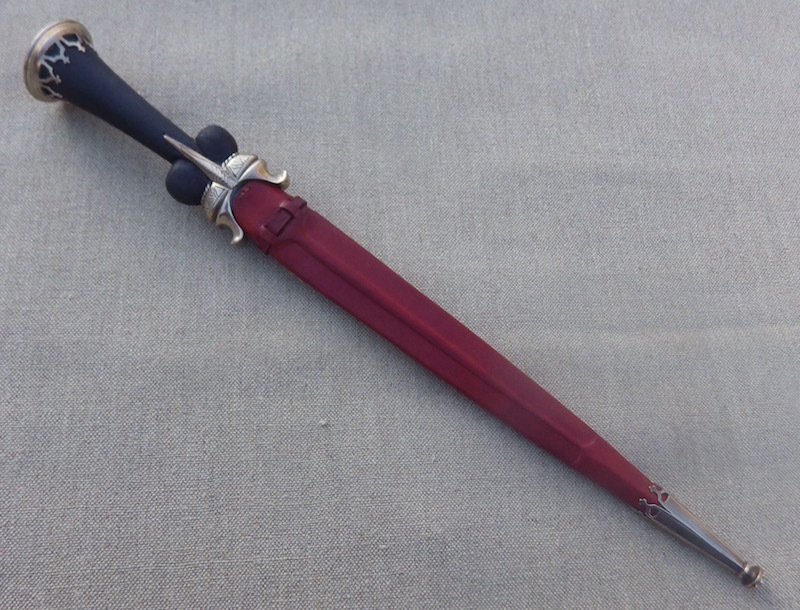 The blade is very curious and I have only ever seen the one shown below. Although I don't have dates for this piece it is pretty similar to the Rothenberg one and I would also suspect German in origin. I don't think the shape has a purpose as such, but it is certainly worth a second look. The ricasso is flat and tapers in, the blade section is hollow ground and the tip has been left reinforced to create a very strong diamond. The scabbard is double layer veg tan leather with a moulded central rib and two simple loops and a bronze chape. Great work on that dagger Tod. Be warned however: many pieces of the Rothenburg collection might not be as old as they seems to be. It is wise to be very cautious in accepting them as genuine. Several swords share suspicious and even damning evidence of tampering. At best composite pieces, at worst blatant fakes. 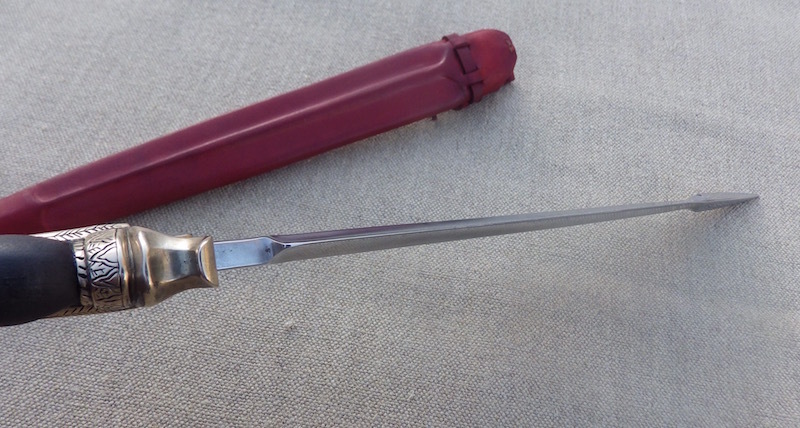 It is impossible to be 100% sure based on photographs alone, but it has to be pointed out that this is one of the last collections one should draw inspiration from when studying medieval edged weapons. There are other collections that has objects with a more secure dating and provenance. 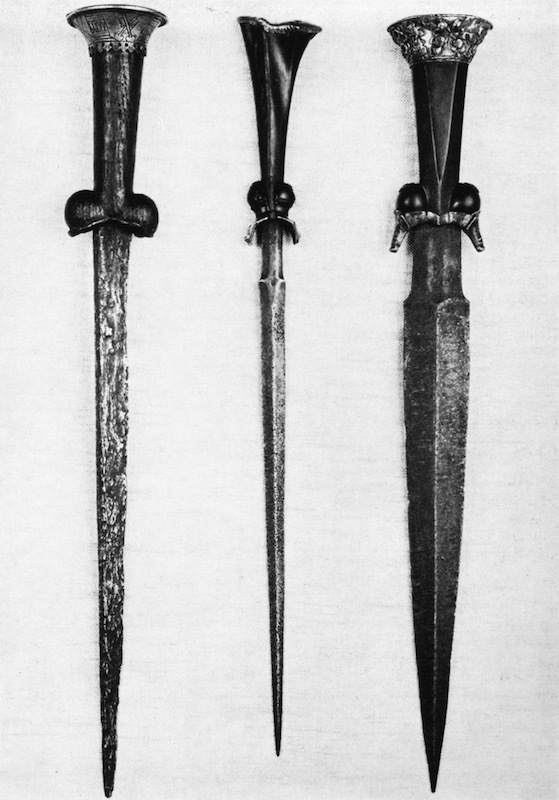 The last photograph of the three daggers, shows one that is currently in the Deutshces Klingenmuseum. It is a great looking piece with bold forms and in a very good state of preservation. 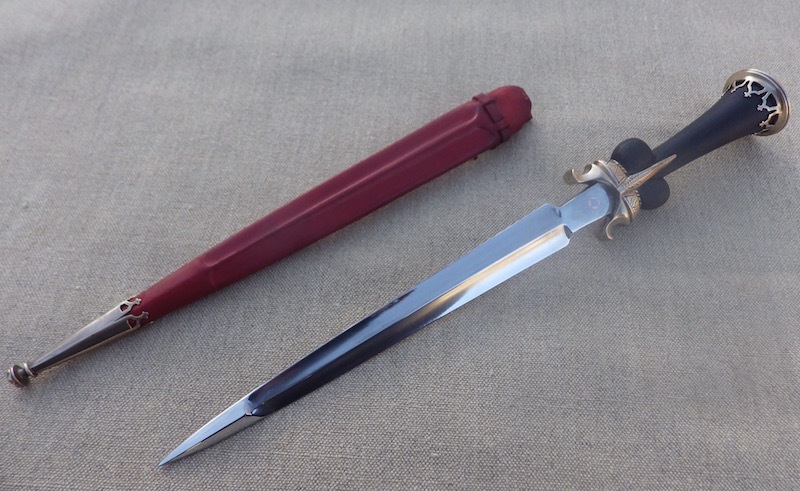 The blade might be original, but the hilt is probably a modern replacement. I discussed this with Lutz Hoffmesiter at the museum. He has doubts as to the authenticity of the whole piece. I tend to think that blade is original. Just goes to show how difficult this can be. Yes I have heard this Peter, but in a way if I am cautious this does not matter to me too much. Let me explain. I very rarely make an exact copy of a piece, however if I do, I think the exact provenance and authenticity of the piece is very relevant as the dates and find location etc form part of the finished piece. However I usually work by taking inspiration from pieces to create a piece that 'could have been'. By this I don't mean fantasy in the sense that Leonardo could have built a diesel engine, so one day I turn up with one and say it is authentic, but in the sense that if a knife seller from 1480 had my piece on the table it would not get overt attention for being odd in some way. To this end I take construction, design, form, proportion, styles, dates and geographic origin etc into account to and put together a piece that I like and that 'fits'. As long as I look at the pieces in Rothenburg or anywhere else, with a careful eye making sure I don't use any elements that are inappropriate, then I am happy to use them as inspiration. The Right Hand of the Lord has made Valour/Courage, i.e. has made the bearer courageous. More strength to your arm. I must say I am intrigued by the narrow bladed dagger in the middle of the historic photo, with the asymmetrical grip. Any info on that one? Thoughts about the grip shape? Beautiful details, beauty inspiration. Rich techniques workshop. Great. Leo, use a lower temperature flame (steel - copper) - see the bubble on the insert. 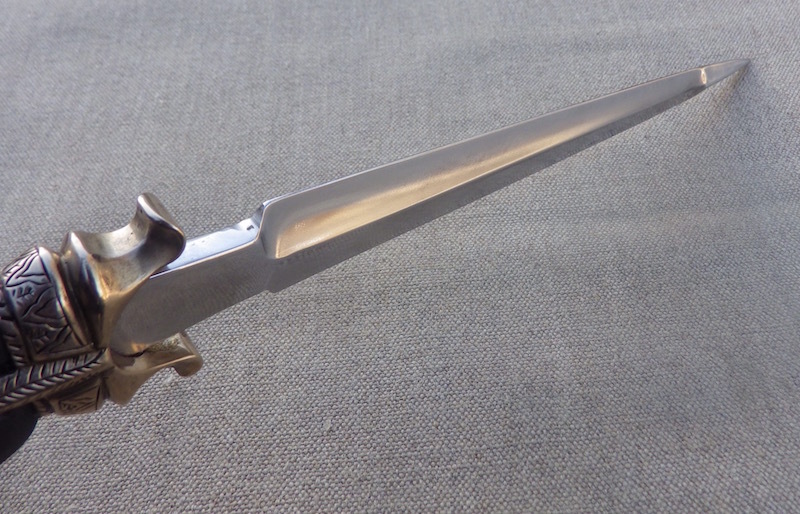 Well Tod, regardless of any questions of the originals provenance, your dagger is stunning. As to the dyed grip, would that have been how they did it historically? Or is yours meant to represent something like ebony/blackwood on the "original"? Thanks for the compliments and also the advice. I do find getting this perfect quite hard and yes a softer flame does help; but still. Thanks Matt. I am not sure of the wood used on the original, but my first guess would be ebony and my second would be dyed box wood. I use the elm for cost reasons, but I can of course use ebony, but for stock items the cost is a bit of an issue.